enhanced investigation to identify agents and vehicles in foodborne outbreaks. MDH has an experienced and internationally respected foodborne illness investigation team, and is widely recognized as having a world class foodborne disease outbreak detection and investigation system. 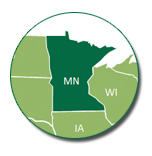 In Minnesota, submission of clinical isolates of reportable pathogens (e.g., Salmonella, E. coli O157) to the MDH Public Health Laboratory (PHL) is mandatory. The PHL confirms and subtypes all isolates by PFGE in real time. FVZDU staff routinely interview all reported cases with a pathogen-specific form (which includes specific food product details such as variety, brand, and point of sale or service). Cluster investigations are conducted using an iterative approach. MDH epidemiologists oversee a team of interviewers (“Team Diarrhea”) who are part-time MDH employees hired from a pool of MPH students at the UMN SPH. These students are intensively trained and supervised by MDH epidemiologists. When a suspect food vehicle is identified, the lead epidemiologist works with the appropriate state regulatory agency (MDH Environmental Health or MDA) to address the suspect food. This often entails food product tracing by the Minnesota Department of Agriculture (MDA) to support the investigation. Since 1998, MDH also has operated a statewide, centralized foodborne illness complaint system to detect outbreaks. During 2000-2006, the complaint system led to the detection of 79% of all foodborne outbreaks and 25% of salmonellosis outbreaks. Our investigations have frequently revealed new foodborne illness vehicles and/or flaws in food production. There are many recent examples in which MDH efforts were particularly instrumental in solving multistate outbreaks. We have a strong history of publishing the results of these outbreak investigations (often with colleagues from other states and CDC; see the bibliography). Following are selected examples from the last 10 years. In 2003, we identified an E. coli O157:H7 outbreak due to non-intact, blade tenderized frozen steaks, the first documented outbreak due to this type of product. In 2005 we identified: cake batter ice cream from a national chain as the cause of a Salmonella Typhimurium outbreak in 9 states; an E. coli O157:H7 outbreak associated with pre-packaged salads containing romaine lettuce; and, S. Enteritidis and S. Heidelberg outbreaks associated with frozen, microwaveable, stuffed chicken products (multiple outbreaks due to these products were identified by MDH but none by other states – an important validation of MDH exposure assessment methods). In 2006 we helped identify: an E. coli O157:H7 outbreak associated with shredded iceberg lettuce served at a Mexican fast food restaurant chain; and, a large multistate S. Typhimurium outbreak associated with tomatoes. In 2007, we: collaborated with the MDA to isolate the outbreak pulsed-field gel electrophoresis (PFGE) subtypes of S. Wandsworth and S. Typhimurium from intact packages of Veggie Booty; and, played the key role in identification of pot pies as the vehicle in a large national outbreak of S. 4,,12:i:- infections. In 2008, MDH played a key role in solving the national S. Saintpaul outbreak associated with hot peppers. In 2008-2009 MDH and MDA played the key role in solving the large national S. Typhimurium outbreak associated with peanut butter. In 2010, we identified a S. Newport outbreak associated with blueberries and a non-O157 STEC outbreak associated with venison. Also in 2010, MDH and MDA played a key role in solving multistate outbreaks due to eggs (S. Enteritidis) and a microwaveable cheesy chicken and rice entrée (S. Chester). In 2011, food tracebacks were used to confirm hazelnuts as the source of a multi-state E. coli O157:H7 outbreak, the first documentation of nuts as a vehicle for E. coli O157:H7.